We have been trying out a few new kids apps recently. We have been looking at ones that are safe, educational, role-playing and fun. We have all played those addictive games that you have to keep things cooking or alive, you live it and well it all goes to pot. This is a bit like that, but it’s fun, educational and they can pick it up wherever they left off. Dr. Panda Restuarant 3 is the third instalment of their successful restaurant games. They don’t have to play it and the characters bring the game to life. What I like about it, is that it teaches children to read reactions and gain some empathy and judging what people want and don’t want. This isn’t something that is normally taught in a game. Usually, it’s just maths or spelling. This one the characters come to life and you judge from their reactions what they want in their food and what they don’t. Clever! 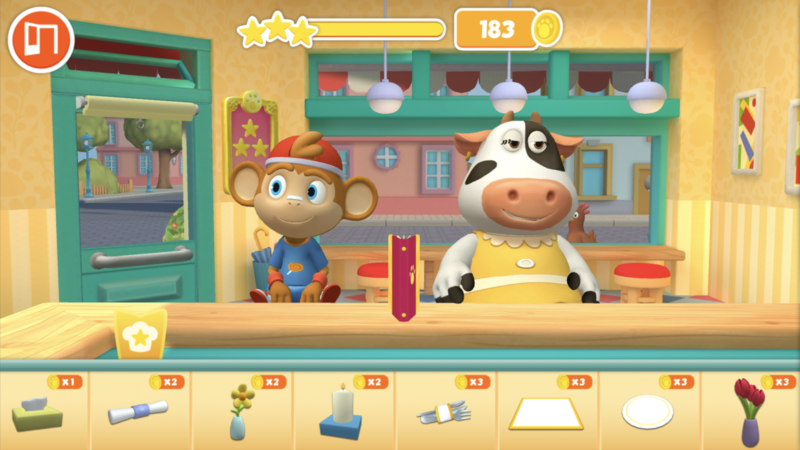 The game is free to download and had the child cooking and serving up various dishes for Dr. Panda’s Restaurant customers. There are several different characters that come into the restaurant and sit down to have a nice meal. You get either one or two at a time. I do also like the little chicken that hovers outside, but not worked out if he does anything or night. It’s all very cartoony, inviting and a fun, safe environment. The kids chose which item to cook from the menu and judge when the customer nods or is more enthusiastic. The more enthusiastic, the more coins and stars they will leave. There are five dishes on the menu book—pasta, pizza, salad, stir-fry, and burgers. All of which they have to prepare. The first one we chose here was pasta. The children might be a little young to deal with boiling water and the stove, but now they can enjoy cooking in without any of the dangers. 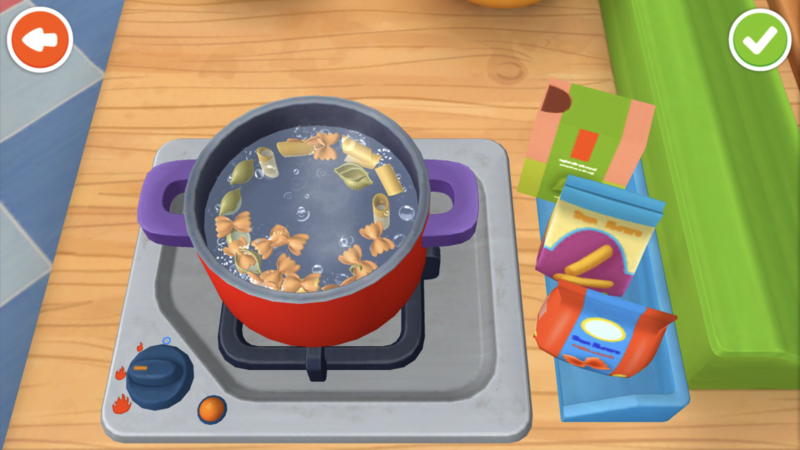 You have to boil the water, put your chosen pasta in, switch it on and wait for it to cook. 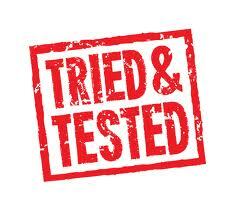 Kids can experiment with various tools, including a knife set, oven, pot, frying pan, and even a grill for the pizza. Head to the kitchen to select the items your customer would like added to their dish. You have a total of 3 to pick and a whole selection in the fridge. 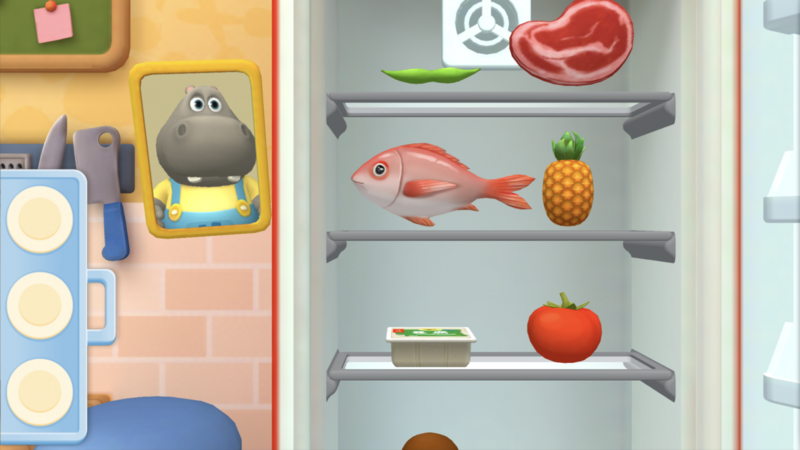 It’s a good talking point to bring up what foods are good for you and most if not all in the Dr. Panda fridge are healthy options. Well done Dr. Panda. They can pick what ones they fancy and like, but the aim is to please the customer. They come through on a screen and nod, shake or get excited about the choice. It is clever. Transferring it to a bowl to then add the chosen sauce. Condiments are then added before serving. You even have to feed the item to the customer. I wasn’t sure about that part at first, I thought they’d eat it themselves, but you can feed them. Plus, if there is another customer waiting, you can feed some to them too. With the coins you select, there are different items to buy. These are one-use items but are very reasonable. We hadn’t played it long and you can see the number of coins we saved up. There are lots of fun things to buy with your coins from candles, flowers, table settings, etc. 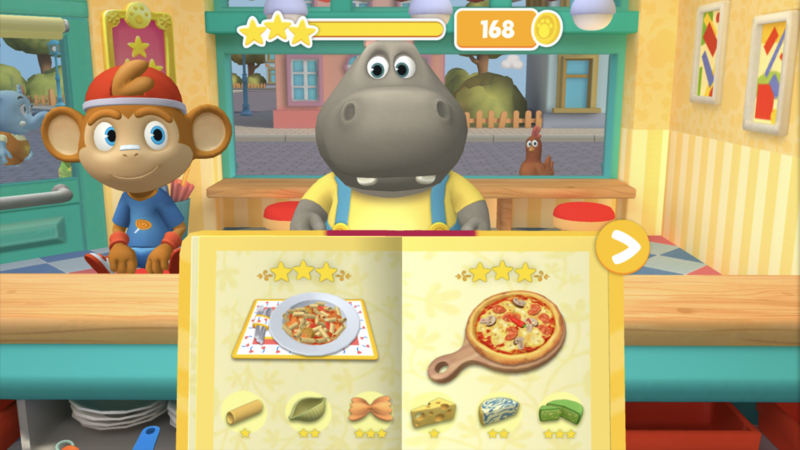 The diner rates the dish with stars then pays for their meal with coins. The more stars you get, the more things you unlock to cook with and make. The one thing I suspect you won’t be keen on as I wasn’t either is that it costs £4.99 a one-off charge to unlock everything. It is not bad if your kid loves the game and you don’t want them to pester you for things they can’t do. There is a lot they can do without you paying for anything, however. 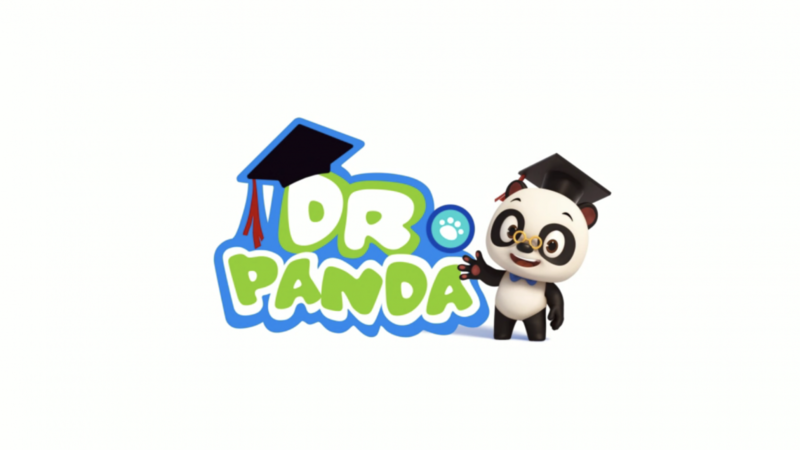 The free app has a fullscreen ad that promotes Dr. Panda’s other apps but doesn’t appear once you’ve made an in-app purchase. I think this is great for teaching kids some basic cooking skills, like boiling water for pasta, sauteing vegetables, etc without the flames, sharp objects, etc. It helps teach them about different foods and judging reactions from people. Not only that it teaches them that they have to do the dishes and clean the counter too. It is a fun way to learn and they won’t even know they are learning. This is aimed at kids aged 4 and up. I think older kids might get bored, but younger kids would love it. I have the chance for not 1 but 2 lucky readers to win a full unlocked version (version £4.99) of Dr. Panda 3 Restaurant App. This will be for Android or Apple. Enter in the Rafflecopter form below. Good luck. 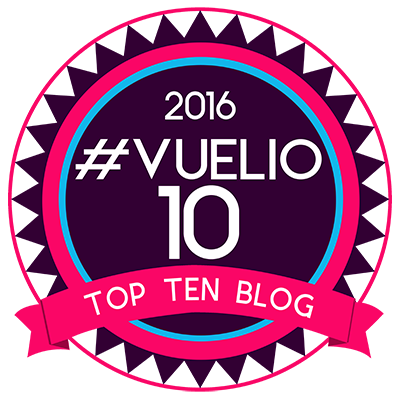 Don’t forget you can still download and play for free using the links below. 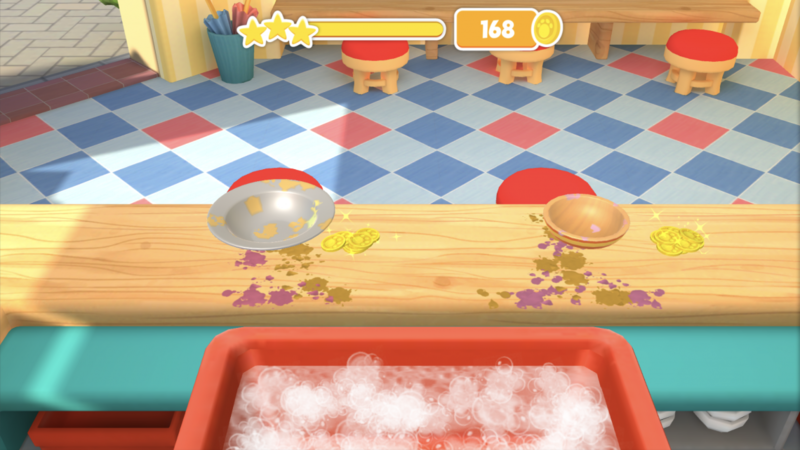 We think Dr. Panda Restaurant 3 is a fun, educational app that kids can have some fun cooking in the kitchen in a safe environment. 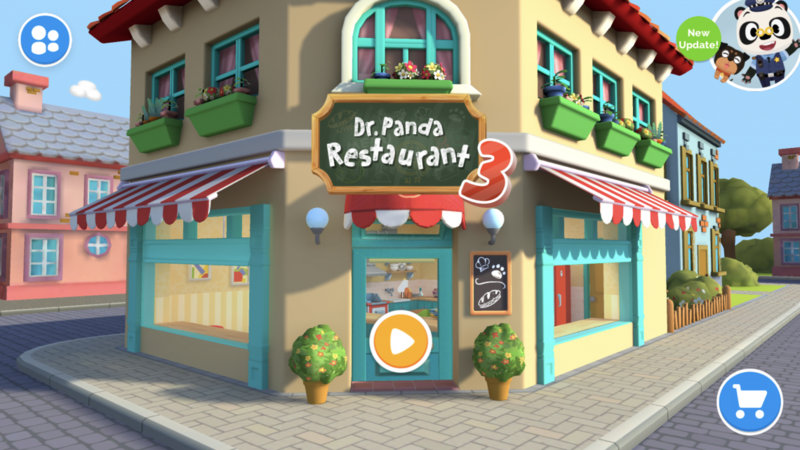 Dr. Panda Restaurant 3 App Store: https://apple.co/2D2w6CX Dr. Panda Restaurant 3 Google Play: http://bit.ly/2FhkRws. Disclaimer:- We were provided with a copy of ‘Dr. Panda Restaurant 3’ for review purposes, but all thoughts and opinions are our own. This sounds like the perfect app for the children i childmind. They would all love this. I would like the app for Apple. MY son has the second one & I know he would love to have this one too. I would make a nice smoothie, whether the customer wants one or not, hee hee! 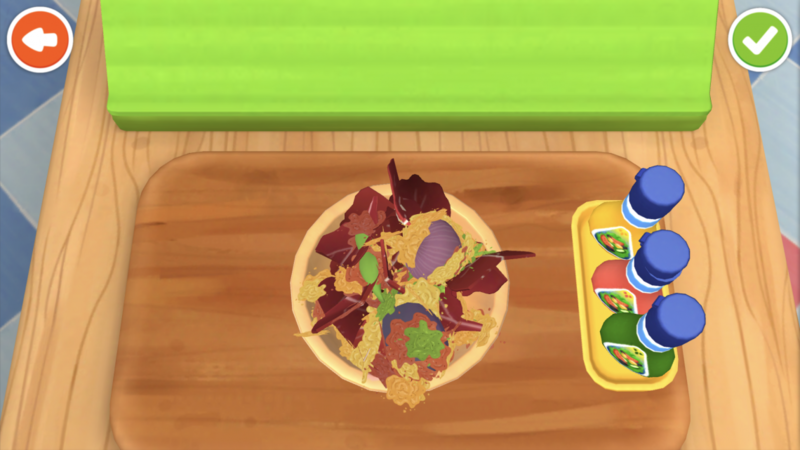 We would like to saute some vegetables on the android version! Android please, and she would love to make a stir fry. I am always saying mummy will be making a stir fry because it’s quick and easy but my eldest who is 6 is desperate to help and I don’t want her burning herself. This looks great fun for both of my girls.